Meanwhile the stamps I have for you this week are those issued in 1970 on the centenary of his death. Bottom row: David Copperfield and Betsy Trotwood; Oliver Twist asking for more. Charles Dickens...reminds me so much of my childhood with his Oliver Twist...LOVE it! And the stamps are so nice too! Great stamps, and a great project. Now I know such an interesting project is almost done. I'm proud to say I read Bleak House and enjoyed it - on my own, not for school. It's a shame the Dickens anniversary is a little overshadowed by the queen's Jubilee and the Olympics. It's a busy year for events. What a marvellous project you have been involved in, a Victorian internet. Love those old magazines, I have a few bound copies but unfortunately no Dickens in them. That’s very noble - doing all those corrections. I do love old Mr Dickens! That sounds like an interesting project. I had no idea that Dickens was involved with magazines. 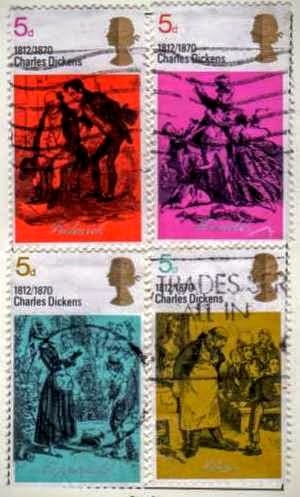 I love Dickens' works..it's good to know that he is still being honored for his achievements today..